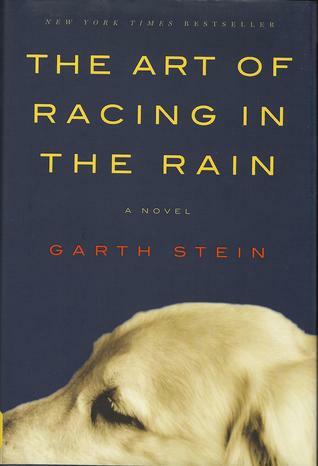 The Art of Racing in the Rain is about a dog named Enzo, whose owner, Denny, is a race car driver. Enzo longs to be human, but has to settle for making philosophical observations about his surroundings that he is sadly unable to share with anyone else. Enzo enjoys watching TV, especially racing, and knows just about everything there is to know about the sport. Enzo also knows a lot about life from his hours of watching TV and the interactions between his family members. Told in reverse as Enzo reflects on his life, The Art of Racing in the Rain explores what it means to be human — from a dog’s point of view. It’s a bit cliché, but that quote rang true, especially when viewed in the context of the entire novel. It appears about 22% into the novel, but I thought back to it toward the end, when Denny has accomplished something everyone else was trying to tell him to give up on. Denny was, indeed, a true champion. While I’m on the subject of Denny, I must say that I loved his relationship with Enzo. It was so touching, especially at the end when he tells Enzo that he knew they belonged together. It was at that moment that I found myself really wishing that Enzo could talk and tell him the same thing. I felt their relationship was entirely believable — if I ever get a dog, I would very much like for him to be like Enzo — and Stein did a great job of making the interactions between man and dog feel natural and real. That being said, the novel isn’t all happy. And it was in the unhappy parts that I think Stein’s writing shone. I am not ashamed to admit that I cried at the end, because I think that is the mark of a great writer. Any author who can make you feel so deeply for the characters and what happens to them is a success in my book. And I really did care about Enzo and Denny, and even Eve and little Zoe. Whenever they were separated, I couldn’t wait until they were reunited. I felt utterly invested in the relationship. And that is what makes this such a wonderful book — dare I say such a perfect book — you can’t help but care about the characters. Even knowing the inevitable, I kept hoping against hope that things would work out for the best. And even though that didn’t happen, I finished the book feeling fulfilled. I wouldn’t change a thing about the ending, or about any of the novel. I can definitely see myself reading it again and again and loving it every bit as much as I did the first time. Tagged garth stein, the art of racing in the rain.